Offering you a complete choice of products which include 3/8 cu. x 3/8 cu. 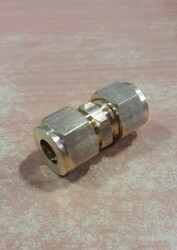 connector/ union with 3/8 nut & ferrule at both side. The 3/8 X 3/8 union with ferrule and nut is used to connect copper pipe at home concealed fittings for LPG use.